Beam Cross Section - (Inches) Choose an option3"x4"5"x4"5"x5"6"x3"6"x4"6"x6"7"x3"8"x2"8"x4"8"x6"8"x8"9"x5"10"x3"14"x2"16"x2"10"x2"10"x5"
Note: If you have chosen a ‘Lightly Worked’ or a ‘Heavily Worked’ beam from the above choices, unless specified in the ‘Order Notes’ upon checking out, we will work the largest beam face. Please state in the order notes section if you have a specific requirement or want the beam a different way. if you are not sure of the difference between the finishes, please watch our video at the bottom of the page. If you are looking for a custom size beam, please order the size above what you require and specify your chosen size in the ‘Order Notes’ section of the checkout. We will ensure that it is planed to your specific required dimensions. The cross section sizes listed are starting sizes and will reduce by up to 20mm on each face after being planed and sanded so you may wish to order the next size up to allow for this. 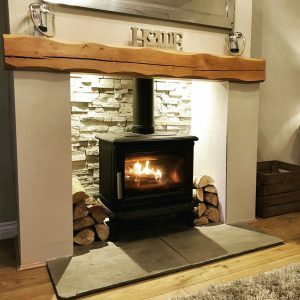 Celtic Timber are the UK’s leading supplier in the sale of oak beams for fireplaces, fire surrounds and mantles. Our beams are handcrafted by our team on site in order to make the perfect oak fireplace or oak mantelpiece for your home. 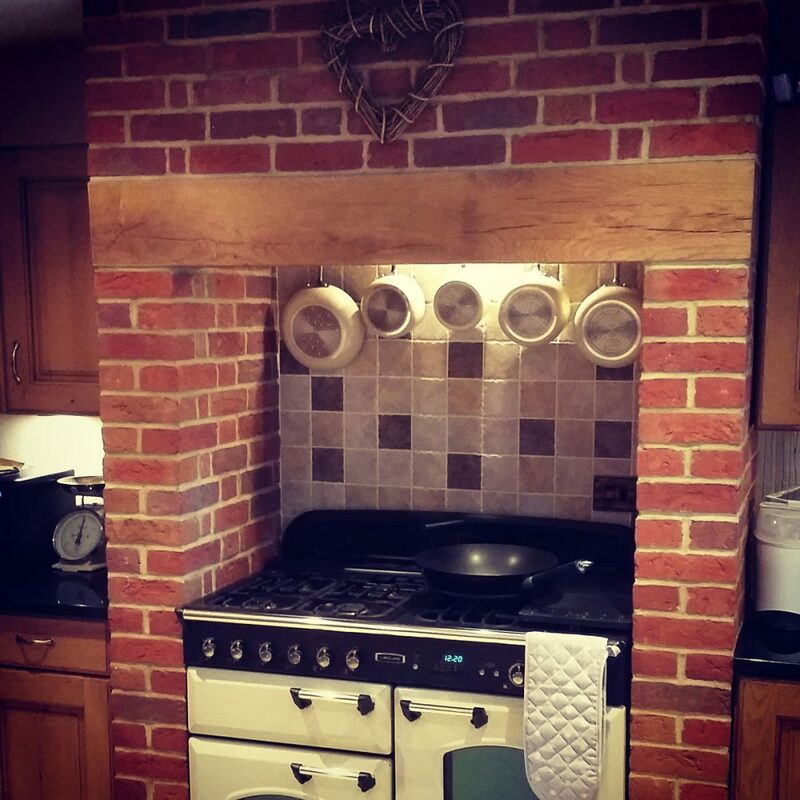 Ideal for oak beam kitchen lintels as well as fireplace beams. Our solid oak beam range of fireplaces and mantelpieces have each been handworked and are available air dried in a variety of sizes and finishes. Oak is a natural product and therefore each individual piece will be different in appearance and will vary slightly in colour and grain. Our character grade beams may well already contain knots, surface cracks, pin holes and waney edges and cracks would be expected to develop further once they acclimatise to a new environment after purchase. 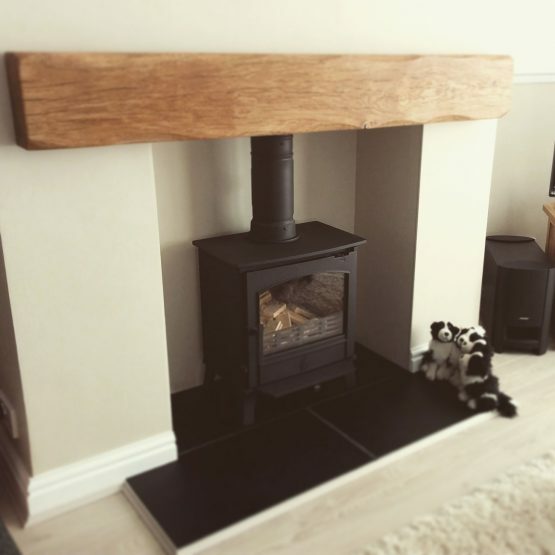 Although our beams are air dried, it also is not unusual for the oak to develop further shrinkage and movement as it continues to dry and adjust to your property’s temperature. If your beam is going to go above a fire, log burner, fire or intense heat, we recommend that the heat should be gradually increased over a period of a week or more if possible. Please ensure that your beam is taken out of its wrapping immediately after receiving delivery to allow it to breathe and adjust. We do not pre-drill beams as customers will need to ensure that fixings are secured to the wall are in the correct place. Depending on your choice of beam size, we will send you straight brackets, T-Shape Brackets or keyhole brackets. Should you have a preference, please leave a note in the ‘Order Notes’ section of the checkout when purchasing your oak beam. 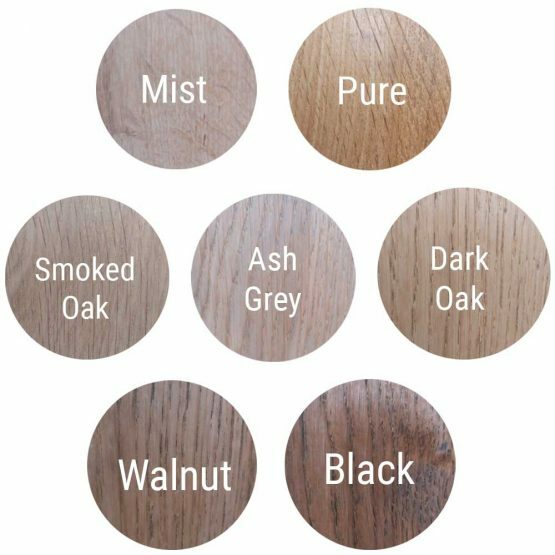 See our image gallery for a representation of how the different coloured oils will look on your oak beam. Please bear in mind that the grain and colour of each piece of wood is different so this is a rough guide only. If you are looking for a bespoke size beam, please order the size above what you require and specify your chosen size in the ‘Order Notes’ section of the checkout. Planed and Sanded for the perfect finish. Click Here if you are looking for Planed Only. Using a spirit level draw a straight level line on your wall where you intend the shelf/beam to hang – Draw the line the same length as the shelf and mark the centre point (this will be the centre of your beam). Mark where the brackets need to be on the wall and transfer these measurements onto the beam. Draw a straight line down the middle of the side of the beam you intend to put against the wall, then mark the centre of the beam. Measure out from the centre evenly each way and mark where your brackets will go. Transfer these measurements onto the straight line you have drawn on the wall. Using the 12mm drill bit, drill into the beam just slightly longer than the length of the brackets (excluding the threaded part) – it is important to drill these holes straight and level. Using the 10mm drill bit, drill a 60mm deep hole into each of you bracket markings on your wall keeping the drill straight and level – tap the rawl plugs into the holes, they should be flush with the wall. Using the 10mm spanner screw the fixings into the wall. Don’t tighten all the way, the washers are optional and increase the load capacity of the shelf however they will leave a small 1.5mm gap behind the shelf / beam. Gently Slide the shelf/beam onto the brackets ¾ of the way on so that you can still fit a 10mm spanner behind it. Place the spirit level on the shelf /beam and adjust the brackets with the spanner until the shelf is perfectly level. The threaded part of the bracket is positioned off centre the steel rod section enabling you to adjust the position of each bracket. Finally, slide the shelf/beam all the way back flush against the wall and you’re done! Using the 12mm drill bit, drill into the beam just slightly longer than the length of the brackets – it is important to drill these holes straight and level. Step 5: Fix the T-Type brackets to the wall using a screwdriver. Due to the thickness of a T-Type bracket, you may wish to rebate a small amount out of the oak beam in order for accommodate it (approximately 3mm) in order for it to fit flush against the wall. Use a spirit level to accurately ensure that the brackets are level with each other before fixing into place. Step 6: Fit the beam fully onto the bracket. As there is no grip on the T-Type bracket, we advise that you use a small amount of adhesive to ensure that it fits firmly in place. Your bracket should now be successfully installed! Did someone say free beam? 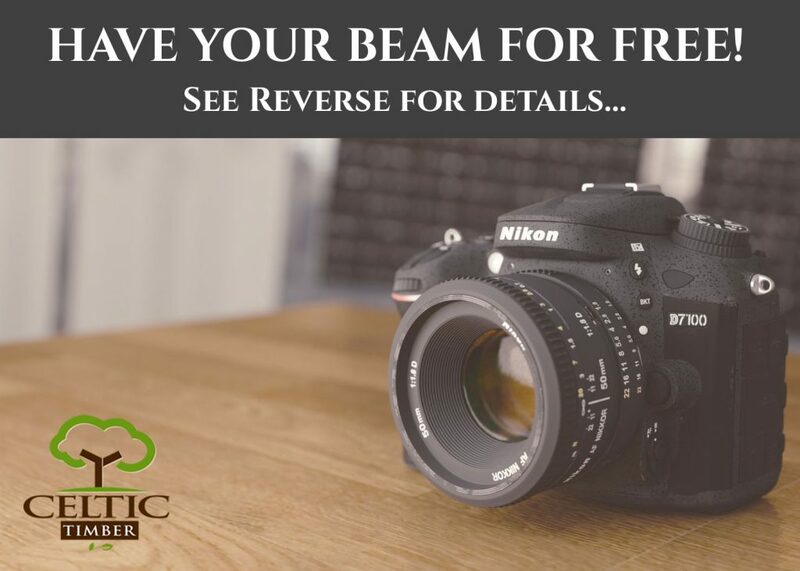 Every month we will publish a post with all of the pictures – the one with the most ‘likes’ or reactions will be named the winner and will receive a full refund for the beam! Keep an eye out for our post at the start of the following month with all of the competition entries. The vast majority of oak beams that we sell are Planed and Sanded Oak Beams. This means that, with a little Danish Oil or Coloured Oak Oil, they are ready to be installed above your log burner or fireplace. We do also offer beams that have been Sawn Only or Planed Only, which are generally better suited to trade customers that have experience in handling and shaping oak. Once the beam’s style has been chosen, the first oak beam variation we ask from our customers is the beam’s cross section. The cross-section is the size of the edges of the beam and is made up of the beam’s height x the beam’s width. The wider the beam, the further it comes from the wall and the larger the beam’s height, the larger it looks from the front. There are obvious practical and aesthetic implications based on the beam’s cross section size. 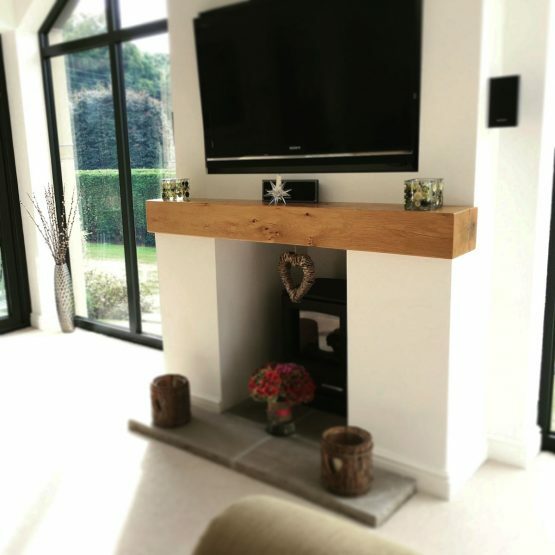 Whilst oak beams look great in modern, contemporary living rooms as well as characterful, cottage living rooms, you may find that a certain size cross section suits your space better than others. Take your time to browse through our gallery on the Oak Beam Fireplace or the Oak Beam Fire Surround pages to find a room and a style that best matches yours. The next variation we ask our customers for is the beam’s length. This one is pretty straightforward and can be anything from 900mm (approximately 3 ft) to 2400mm (nearly 8 ft) and anything in between. 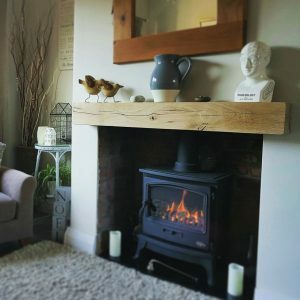 How your oak beam fireplace is finished, along with what oil you use (but let’s not get ahead of ourselves with that one, we’ll save that for number 5) probably have the largest impact on the final aesthetics of the beam. 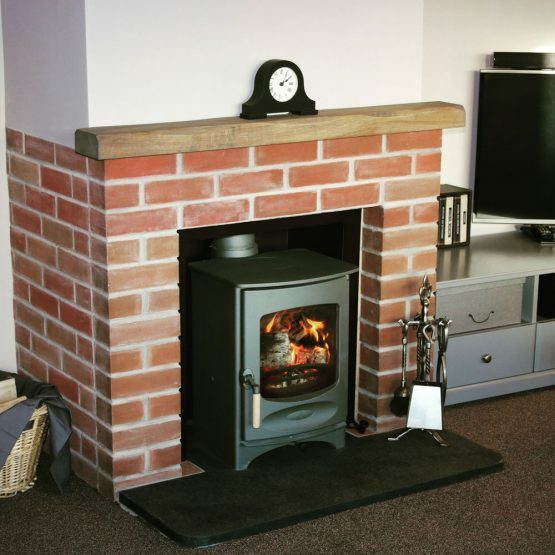 We offer three different beam finishes – contemporary, lightly worked or heavily worked. Our Contemporary finished oak beams have been planed, sanded and had the corners rounded to remove sharp edges. 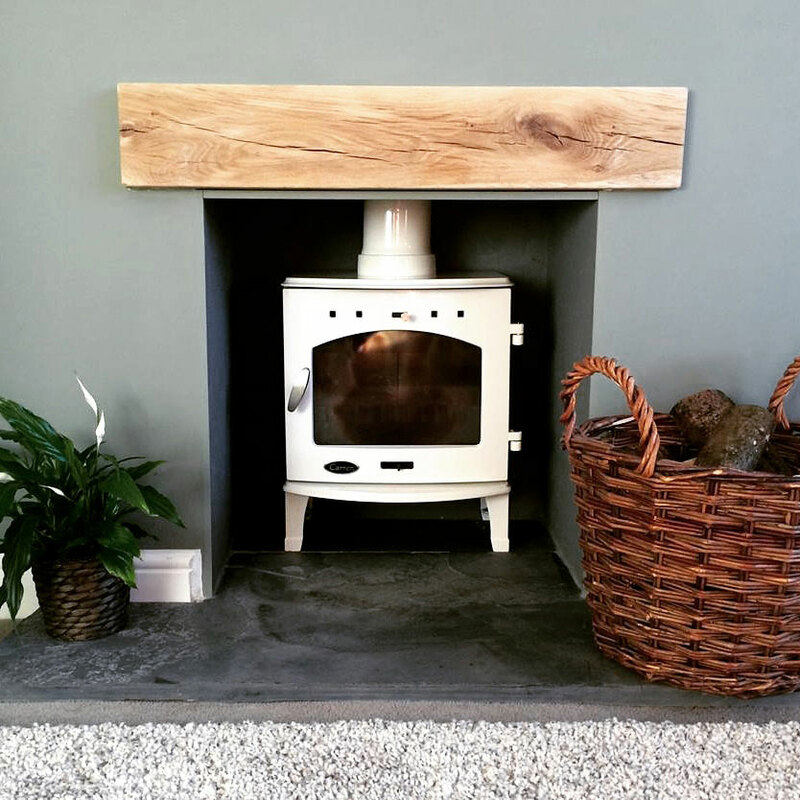 This finish allows the beauty of the oak beam to shine through in its most natural form. Our Lightly Worked beam finish adds a light curve to the edges on the face of the beam, which can add to the beam’s character. Our Heavily Worked beam finish, is similar to the lightly worked beam but with deeper curves. We supply a pot of your choice of coloured oil with all planed and sanded beams. What oil you choose to finish your oak beam, makes a big difference to how the beam will look over your fireplace or log burner. 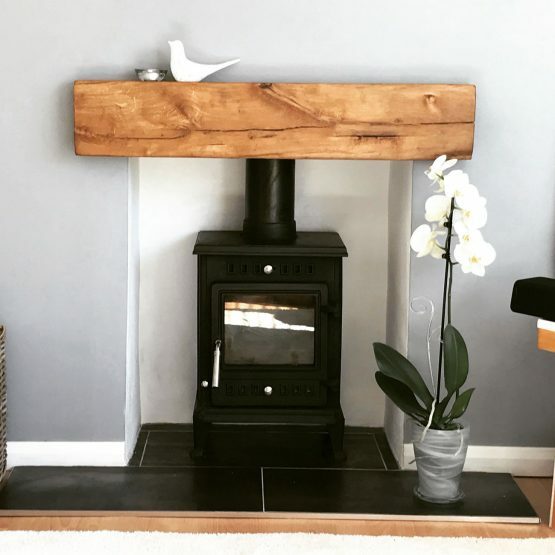 The standard oil that we recommend is Rustins Danish Oil, which is easy to wipe on, protects the oak and adds a slightly darker tone to your oak beam. Should you wish to maintain the beam’s original tone, we recommend Clear Briwax. 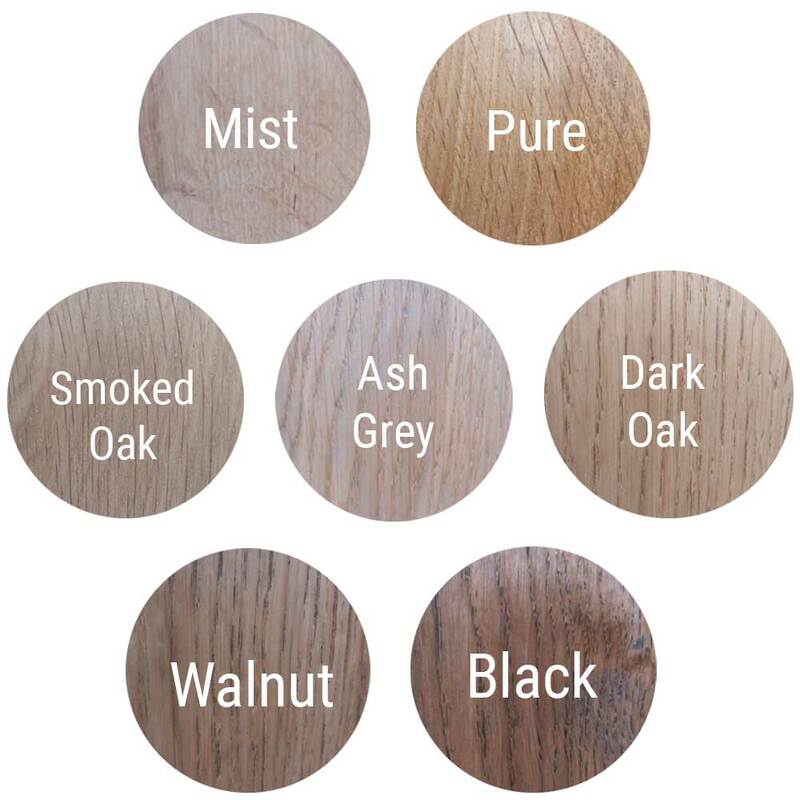 Finally, if you wish to alter the colour of the oak to match your room, we offer a range of Coloured Oak Oils. 6. Will my oak beam fireplace crack after I install it? All of our beam fireplaces are from air dried oak beams. 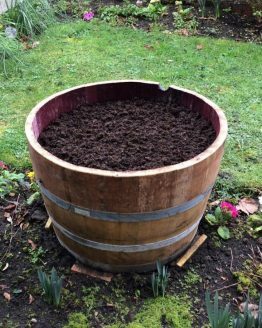 The air-dried process reduces the oak’s moisture, meaning that the cracks that form will be less deep than with green (unseasoned) oak. However, as the oak acclimatises to your home and your central heating, cracks can form. Cracks do tend to add the beauty and the character of oak beams and are usually nothing to worry about. Got another question that we haven’t covered? Our customer service team is available on 01437 710043, from Monday-Friday, 9am-4.30pm and are happy to help answer your questions. This is the second beam I’ve bought from Celtic timber. I was so pleased with the first I bought one for another fireplace. 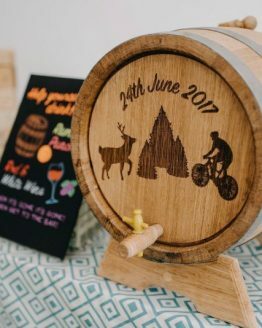 Excellent communication and super quick delivery of a great product. Superb. 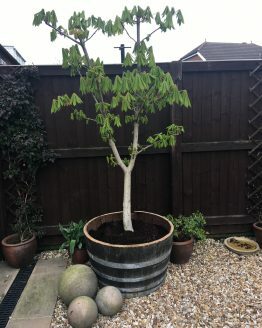 Thank you for sharing Susan, that looks beautiful!